Home / Entertainment / Free Holiday Movies for Kids! Free Holiday Movies for Kids! 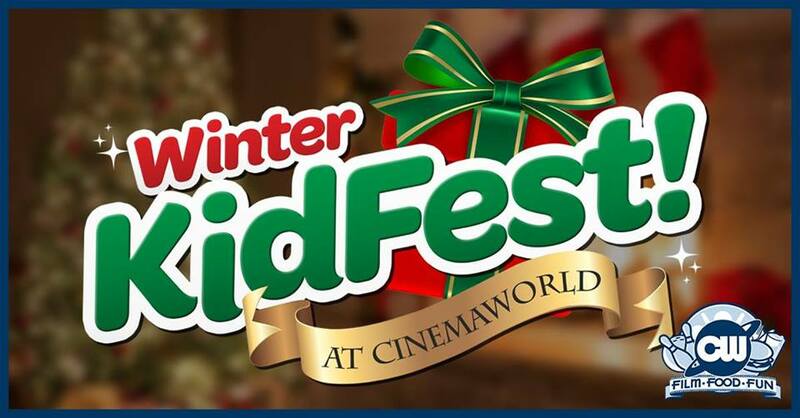 Celebrate Christmas with Cinemaworld’s first ever Winter KidFest! Free films from November 30th through December 24th! Every day at 11am, Cinemaworld will feature a Holiday G or PG rated classic for your kids to enjoy, with new movies premiering on Fridays. Just like our Summer KidFest children are FREE, while adults are just $2 or FREE with the donation of a non-perishable food item to benefit local food pantries this Holiday Season. See Macaulay Culkin in “Home Alone” from November 30 through December 6th, the Will Farrell classic “Elf” from December 7th through the 13th, and from Dec 14th though Christmas Eve celebrate the arrival of Santa with a special extended run of “Polar Express”! Tickets will be available at the Cinemaworld Box Office the day of the show. No group of daycare tickets will be made available. As a family-owned business your patronage means the world to us, so consider this event a special present to thank our guests for an amazing year! We’ll see you at Cinemaworld! Previous Rhode Island Holiday Guide!